Blankney, a small estate village on the B1188 road 11 miles south east of the city of Lincoln and 8 miles north west of the old market town of Sleaford. The village is mentioned in the Doomsday Book of 1086 when it was known as Blachene, meaning Blanca’s island of land. This small village (apart from the Old Rectory) forms part of the managed Estate owned by the Parker family for over 60 years. The estate stretches from the A15, Lincoln to Sleaford road, in the west to Mair’s family farm on the Barff, just east of the B1189, Metheringham to Billinghay road. 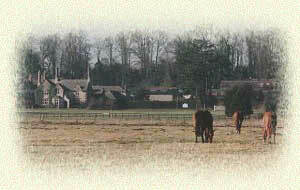 With the exception of a few cottages, the glebe land adjacent to the limestone quarry and Sexton’s field adjacent to the road to the railway crossing at Blankney Brickyard, all the land forms part of the estate. This totals an area of some 12,000 acres. The estate also boasts a superb 18 hole golf course and a thriving Cricket Club which fields teams in 3 local leagues during the summer season. The core of the old estate was Blankney Hall, home to Henry Chaplin, owner of the Derby winner, the Hermit. Now, there's a fascinating story. Alas, Blankney Hall no longer stands, having been gutted by a serious fire during WWII. It was finally demolished in the 1960's. On the western edge of the estate, by the A15 there is a private dwelling, The Green Man which also has a fascinating history, that we are just starting to unearth.